LemonCitrusTree on Bugs on Citrus; Friend or Foe? This entry was posted on February 26, 2015 by LemonCitrusTree. Hi and welcome fellow Citrus growers! One of the questions I often receive is "Why are the Leaves Yellow" on my Citrus Tree? More often, specifically on the Meyer Lemon Tree which is the most the most popular of all Indoor Citrus trees. We will address what causes the leaves to turn yellow and the specific remedies to correct this common issue. 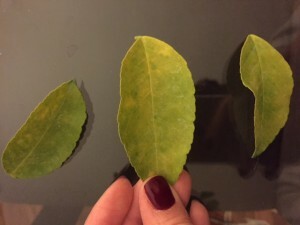 It is common for the leaves at the bottom of the tree or in the interior that are not receiving much sunlight to naturally turn yellow and drop. If you only have a few yellow leaves in those locations then that is natural and part of the trees normal leaf shedding process and poses no concern. This is normally caused by an overwatering situation and/or poor drainage. When the roots sit in soggy soil they will begin to rot and they will lost their ability to carry nutrients up to the canopy of the tree. You may need to change your pot out with good drainage holes and if you re-pot make sure the potting soil you use is lightweight and does NOT contain wetting agents. Secondly, amend your watering and fertilizing as noted below to get your plant on a healthy path (It will take several months to correct this issue, be patient). This is an indication that your plant needs some food. I recommend you feed your plant at least every (3) months but to really give your a plant a "POP" feed monthly starting in March all the way through November. Proper plant food and watering coupled with sunshine will help your plant thrive and aid in its blossoming/fruit production. Consistency is the key with citrus watering. Citrus trees require soil that is moist but never soggy. Watering frequency will vary with soil porosity, tree size, and environmental factors. DO NOT WATER IF THE TOP OF THE SOIL IS DRY WITHOUT CHECKING THE SOIL AT ROOT LEVEL! A simple moisture meter, available at garden supply stores, will read moisture at the root level. This inexpensive tool will allow you to never have to guess about whether or not a plant needs water. It is better for the soil to be on the dryer side when you water. A wilted tree that perks up within 24 hours after watering indicates the roots got too dry. Adjust the watering schedule accordingly. A tree with yellow or cupped leaves, or leaves that don't look perky AFTER watering can indicate excessive watering and soggy roots. Give your tree water less often. Citrus prefer infrequent, deep watering to frequent, shallow sprinklings. Deeper watering promotes deeper root growth and strengthens your tree. Generally, once or twice a week deep watering works well for container specimens. Be sure to adjust based on weather conditions! In general, it is probably best to water in the morning, but if plants are dry or wilted it is better to water them right away than wait until morning. Citrus trees feed heavily on nitrogen. Your fertilizer should have more nitrogen (N) than phosphorous (P) or potassium (K). Use at least a 2-1-1 ratio (For example; a 15-6 -8 or 12-4-5 or 18 - 8-10 would work well ... remember you do not have to be exact, just try to find one that the first number is about twice as high as the other numbers). Miracid Soil Acidifier is a water-soluble product that works well and is a 3-1-1 ratio. In some regions, you may be able to find specialized citrus/avocado fertilizers. Buy a good brand and apply according to package directions. Osmocote slow release plant food is another good fertilizer. Any good citrus formula will contain trace minerals like iron, zinc, and manganese. Many all-purpose products will work. Just add trace mineral supplements if your fertilizer is deficient. We prefer slow release fertilizers in the granular form rather than fertilizer stakes. Follow the instructions on the package carefully as fertilizers come in different strengths, release rates, and application schedules. We recommend that you fertilize more often than recommended with most slow release fertilizers. Foliar applications of trace minerals in the form of kelp or other soluble fertilizers can be effective. Check out our Video Tutorials that cover many of these same issues by clicking here. Wishing you great success with your Citrus Growing!